Business cards are they key to presenting yourself in a good light, impressing important people and getting in contact with those who will further your career. If you think of designing your first business cards soon, or changing the design of those you already have, here are 25 tips to keep in mind. Whatever you do, the business card serves as a connection between your company and your customers. Anything beside that is an extra and should be approached as such. Make sure the main information is correct and well designed before jumping to colors and materials. I may love pink flowers, but they have nothing to do with my writing style or consulting strategy. It might seem easy when you think about it, but you’d be surprised to see how much we lean towards what we naturally like and not what represents our company. Don’t be afraid of doing a little research before deciding on the design. Don’t think it will influence you to copy someone’s idea. You will be able to spot any trends going on in your field and this will prevent you from doing what everyone else is doing with their cards. Also, it might help you decide on things you want to include or elements that don’t fit into your vision. If what you do is funny or entertaining, then no one is expecting a boring card from you, unless you write on the back “This is so boring! Come see how we do fun!”. If you create things, then a handmade card would describe your work more than any words can. If professionalism is the core of you business, then go professional all the way. What is the most important thing regarding your business right now? Did you do a rebrand lately? Did you get upgraded from a specialist to CEO? Is there a new service you started to provide lately? Are there new branches added to the company or new shops opened? Maybe you changed your phone number or email. Or you really need to associate your name to the company. Think about what’s more important and make sure it’s reflected on the card. Think about muliple designs or colors, maybe a series with a story developing so they are collectable and exciting to receive. Pieces of a puzzle would also be a nice idea. For a more classic approach, treat the cards as your portable mini portfolio. Quality is always luxury but luxury is not always quality. Think carefully when you go for fancy embosses or gold foils. If the company you run is about raw materials or living a meaningful life, then lean towards quality with minimal and clean cards. Unless you are 100% aware that everything in your card is in tune with your company’s policies and mission, don’t risk it. You can emphasize the company’s logo by placing it on the whole side of the card. This will help it being recognized and will serve as a cohesive visual for the business cards of other people working in your company. The more people see a logo, the faster they will recognize it (being designed well helps too). If the logo of the company is the name of the company or includes it, make sure to use that and not the name in a random font. That way the connection to the brand is stronger. Imagine a Google card, with the name Google written in another font and in black. It would be harder (or maybe impossible) to connect it to the giant. If you are using colors, make sure they are the exact code of what is used in the rest of the branding material. Also, the overall style should reflect the same one used in every online presence of your company or work. Before you invest in the final result, do a test to check the quality of the printing. Sometimes there’s too much black or dullness. You want to make sure things look sharp and clean. It’s a good time to double-check the colors too. Finally, test the ink to understand if it smudges easily or fades in sunlight, disappears under water or from rubbing. It is very difficult to digest the information when two or more companies are in the same card, unless you want to show your relation to the companies. In such case, use only your name and an email or phone number, along with the companies’ logos. Spare further details to prevent the card from looking like a yellow page. Even if you want a single side business card, you can take advantage of the back to put your signature or a handwritten note. A helpful idea is to encourage people to write something about you or how you met by having a couple of lines ready for them to fill in or a specific phrase like “How we met”. The font of your choice should be legible and neutral enough. Nothing sketchy or tacky should be in your card (unless that is your purpose). You can use 2-3 different sizes and strokes to create hierarchy in the text. Also make sure the numbers are not overlapping each other and are legible. Don’t try to fill in the space, but see it as a tool to showcase the information. White serves as a great canvas, but any other solid color or subtle background can help enhance the text. Use the highest material and printing quality you can afford, but be aware of super bulky cards or ones that can easily be worn out. Use recycled paper if your company is well into the environmental industry. But don’t overdo it only to show that you are environment friendly or you’ll be mistaken for a recycling company. Same logic goes for wood, metal, glass, plastic or any other innovative material. If you are on several social media, make sure to use the same hashtag on all of them. Including only one hashtag in the card will be much more effective and easier to remember than four different ones. If you do something innovative or a very specific service, you can incorporate a photography or illustration of what you do. Also, if your style is coherent and you’re famous for a specific thing, showcase that on all cards. Words can be used too, as long as you can express what you do in a couple of short sentences. There’s nothing wrong with putting your own photo on the card, as long as it brings something extra to the information and matches the theme of your work. It’s a good move particularly when you attend meetings and conferences or travel on a regular basis. Whatever you do, you will want to make your business card memorable by including an extra something with it or telling a short significant story when you introduce your business. Stories and a nice attitude are much more likely to be remembered. Use technology only if it is accessible by your target audience. As a web design company you can use QR codes in your card, but as a florist you might not need it. The less you distance yourself from the audience, the more likely they will stick with you. What is one single thing you want people to immediately associate you with? 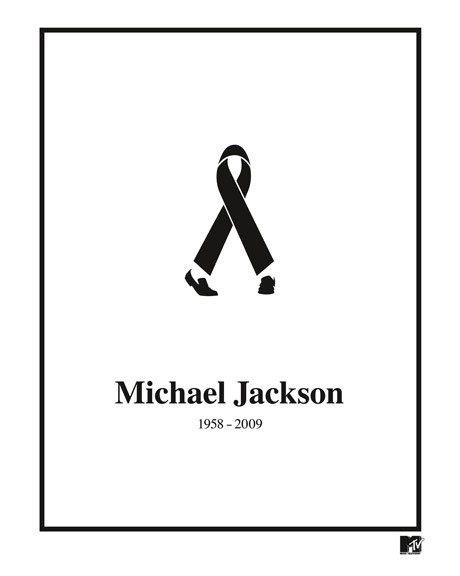 Take a look at this meaningful poster of Michael Jackson. Use what you think is the most unique or strong feature of the company and highlight that. Just make sure it is something you already have and not what you think you do or wish to have some day. Even if you belong to a non-creative industry, you might want to distance yourself from the competition by going with a non-classic shape. Squares, small rectangles and even circles are great to catch attention, but keep it small enough to fit into people’s pockets or cardholders. You might consider a foldable design too. Far away is the era of printing your logo on every commercial object available. Instead, choose a relevant everyday use object and transform it into your business card. Make sure the connection is direct and your company is specialized in that object/theme/industry. If you want to be creative with your business card, make sure it’s so creative that everyone gets it and causes no confusion. Run a little test with people around you. Even if only one person doesn’t get it, you should not consider going with that idea, unless you’re aiming to reach a specific audience. Here’s a list of 30 creative business cards to understand what you have to compete with.